Everyone likes comedy (right? ), but it’s not as funny if you’ve been shanghaied into a low-grade show by one of those aggressive hawkers on the corner of Macdougal and Bleecker. As much good comedy as there is in New York, there’s also enough roll-your-eyes and wish-you-elsewhere material to put you off seeing open mics until the next lifetime. 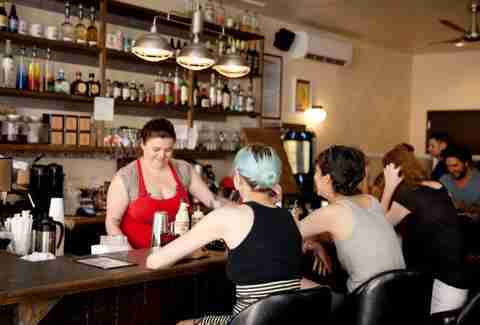 To separate the side-splitting nights from the total snoozers, we asked working New York City comedians to recommend venues for good laugh on the cheap in Manhattan, Brooklyn, and Queens. “This feels like a place Lady Gaga would have started out playing music at 10 years ago,” says Buteau. 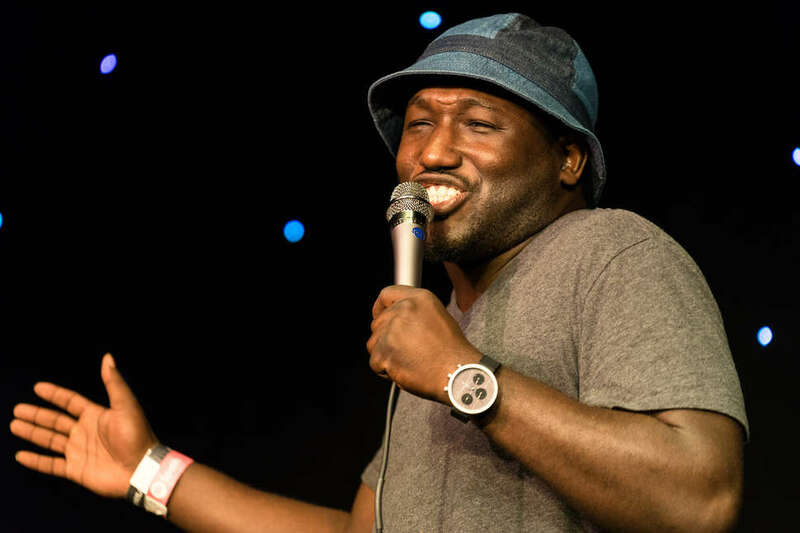 Hannibal Buress founded Comedy at the Knitting Factory in 2008, before he got hella famous -- these days the Sunday night gig is an established favorite on the NYC circuit, and has hosted the likes of Louis C.K., Chris Rock, and Dave Chappelle. Buteau says the big names make it feel “more like LA than NYC,” but there’s a touch of European tradition too: comics get a flat 15 minutes on the mic, regardless of how long they’ve been in the game. “It's very campy and silly,” Coppock says of "Bitchcraft!," the quarterly show she co-produces and co-hosts at this stylish karaoke bar. 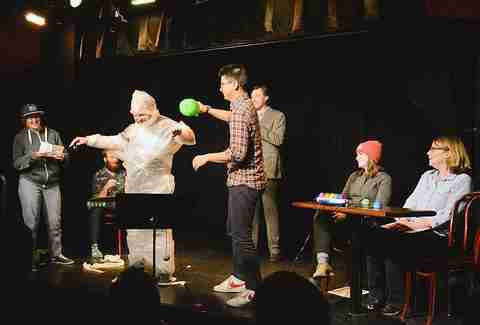 The show blends stand-up, storytelling, singing, characters, and, naturally, costume changes. After the show you can even “belt out a few hits yourself,” thanks to the prominently placed piano, open to all talent levels. Coppock calls the $10 monthly show Petey’s World at The Creek “a safe bet” thanks to a diverse cast of comics, at least one of whom will surely share your sense of humor. Comic Petey DeAbreu runs the show, and there’s Cal-Mex food and $6 beers to add to the allure. Jo Firestone (you know her from The Tonight Show and 2 Dope Queens) recommends this “cool space where you wouldn't expect to see comedy.” Its proximity to sceney restaurants and clubs means you should expect a “very attractive crowd.” As Firestone puts it: “Go for the laughs, stay for the audience full of hot people.” Keep an eye out for Lady Lovin’ podcast host, Greta Titelman’s monthly show, "Room Service." “She's a really fun, dynamic host and it’s always a great line-up,” Firestone says. Firestone is also a fan of this bar/café/yoga studio/performance space that is truly a manifestation of millennial Brooklyn. She likes "Live From Outerspace," hosted by Erik Bergstrom and Molly Austin (Fridays at 9pm) as well as “super-fun” weekly improv by The Postmen. If you haven't seen the Postmen, Firestone has some advice: GO SEE THE POSTMEN. The group consists of Anthony Oberbeck, Carmen Christopher and Matt Barats, who are “delightful and so funny.” Up N' Coming, a monthly show by comedy duo Reformed Whores is another Firestone favorite. Buteau recommends this Brooklyn hangout for “weird, crazy, one-off shows.” The basement, which “feels like a speak-easy,” is where she recorded her album: “Because the room is small, it always feels crowded -- a good thing for comedy -- and the vibe is different every time.” She also loves that lineups here often include multiple women, even when the shows aren’t labeled specifically as women’s shows. Comedian Lesley Hennen confesses she is “obsessed” with this venue: “They have really great shows seven nights a week -- my personal favorites are "Trike" and "The Cast," and on Tuesdays and Wednesdays you can see the house teams in four back-to-back hours of improv, for just $7.” Hennen also recommends Perri Gross’s monthly stand-up show, "Everyone Is Sad," which features up-and-coming comedians alongside stand-up veterans: Book in advance because the $7 tickets tend to sell out. Think you can do better? 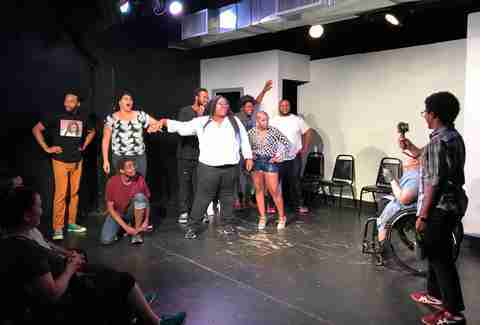 Enroll in the Magnet’s free one-hour introduction to improv class. 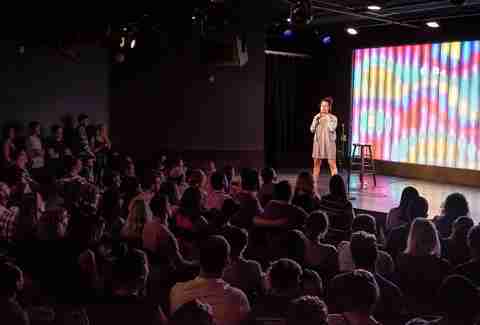 Astoria-based comedian and Girl Code producer Chelsea White stands by her neighborhood’s only comedy venue as a go-to for up-and-coming comedians and established old-timers. “Kambri Crews, Q.E.D. 's proprietor, is plugged into the comedy scene and super-passionate about fostering community,” she says. “This is killer entertainment in a laid-back, neighborhood-y environment.” If you need a little extra encouragement, remember that Artichoke Pizza and a cluster of Greek diners are just steps away. Melissa is a writer based in NYC who is also a great place to see comedy. Follow her on Twitter and Instagram.